But we'd value any other thoughts. All the praise, glory, honour and blessing belong to you before anyone else. They are yours alone, we are not good enough to even speak your name. May all your creation and its creatures praise you. First and foremost, Brother Sun. Who brings the day, and who you created to shine light on life. He is beautiful and radiant in all his splendour. His majesty points to you. Shining clear and precious and beautiful. Sustaining the tapestry of the life you created. simple and yet precious and pure. He is entrancing, playful yet powerful, even dangerous. Paint a picture of your goodness. Who deserve your honour above the rest of us. We sing the greatness of your name. They will continue to live with you, they have nothing further to fear. May we follow you and serve your purpose with the utmost humility. But he would be the focal point of the whole community, the one who would enable the community to act, whether in worship or in service. He would be the animator of the individual members of the community, enabling them to make their various contributions, enabling the preacher to preach and the teacher to teach and the prayer to pray and the prophet to prophesy. He would be the necessary sign of the power that is in all of them,. He would be the sign of unity that exists among them. He would be their link with the outside, the sign of their union with the outside, the universal church. He would be their priest. And he would not be painted into a sacramental corner or restricted to the sacristy. Wherever and whenever the community acted as the Christian community he would be carrying out his function, the focal point of the whole community, building that community, holding it together, animating it to action, signifying it’s unity, enabling it to function, If that community were at worship in the liturgy of the Word, he would not be the reader or the preacher or the teacher; he would be the one enabling those people, not as individuals, but as community, to hear that Word, to understand it, to judge it and discern it, to make it live, to let it act on them. Each one could do the same in the privacy of his home, but doing it in community adds an entirely new dimension, the power of the Spirit given to that community to reach to the throne of God, to hear the Word of God to carry out its mission. There are still some issues left in this for me... notably, does the guardian always have to be the "focal point", though that may just be my experiences/modern understanding of the role of Priest colouring my understanding of what Donovan means... or it maybe a remnant of his Catholic context? This morning I led a seminar at the Christian Resources Exhibition... entitled (their request!) 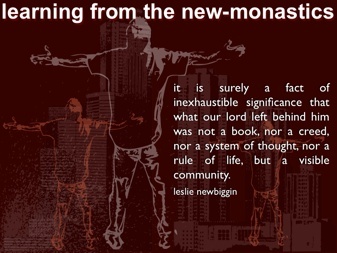 "Learning from the new-monastics"... click here for a quicktime version of the presentation (nb. you'll need to pause the movie to read some of the quotes) ... a recording of the talk will be available soon... i.e. when they send it to me so I can convert it and upload it. Small AND beautiful... Italian style!